North-east butcher George Payne beefed up Newcastle University Racing’s recordbreaking achievement in an annual inter-university track race at Silverstone. 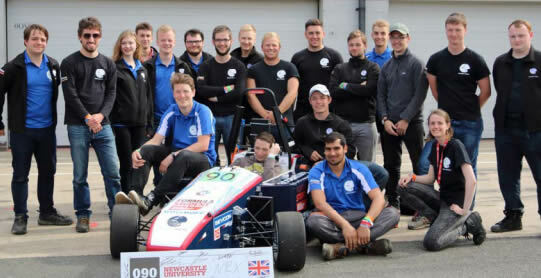 Competing against 70 other universities from around the world, the Newcastle outfit put up an electrifying performance to become the first UK team in Formula Student history to compete in and get an all-electric car through scrutineering and onto the track. George Payne remains one of Tyneside’s longest established and best-known traditional independent family butchers and his Princes Road shop is this year celebrating its milestone 30th anniversary. The business, which has won multiple awards across many years for its products, specialises in supplying meat from British and native breed cattle, sheep and pigs, the majority sourced through field-to-fork partnerships with Northumbrian farmers. A former Northumbria Butcher of the Year winner, George Payne remains one of celebrity chef Rick Stein’s ‘Food Heroes.’ He is a founder member and former regional and national chairman of the Butchers Q Guild, which represents over 120 of the country’s leading butchers. “Well done to Newcastle Racing on their electrifying success on the track. We were happy to provide some meaty support!” said George.